Are you a scientist, teacher, engineer, or may be just have a passing interesting in the subject? If the answer is yes, there’s a new geeky, scientific Kickstarter campaign just for you. The new Kickstarter campaign is for a product called PT Cubes by Brian Meyers Jr. PT Cubes are the stackable periodic table elements perfect for displaying on your desk. 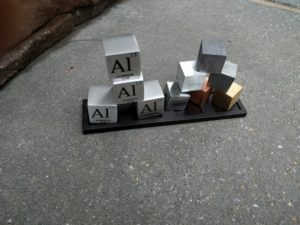 For the low price of $34 (Kickstarter Price) you can reserve your set of 4 cubes and black annodized alumnium base. May you have an interest in science or may you you just want to look smarter at work, whatever the reason check out the campaign. For the lower level (Starting at just $38 USD), you will get 4 PT Cubes with 1 stand. The elements you will receive are Aluminum (AL), Zinc (Zn), Iron (Fe), and Chromium (Cr). Digital Mock-Up of Lower Level PT Cubes Digital Mock-Up of Lower Level PT Cubes. Yes, there are several rewards to sweeten the deal. $1 is basically a thank you. $34 or more gets you the cubes and a thank you on web site. The backing level goes all the way up to $900 where you will get 10 sets of Lower & Upper PT Cubes, each with 8 Cubes and 2 stands that you can either resale or give away. My favorite, recommended price level, is the $99 level. At $99 or more you’ll get of course a thank you on their web site, 1 set of Lower & Upper PT Cubes with 8 Cubes and 2 stands. At $99 you make sure you get everything, the lower and upper cubes. Each display base is made out of annodized alumnium. In the base there are 4 cutouts to put your periodic table element blocks. If this interests you I’d go ahead and back the campaign today to take advantage of the early bird pricing. Brian Meyers Jr. is almost halfway to meeting their set Kickstarter goal. The cubes are scheduled to ship September 2018.